ALWAYS ON THE LOOKOUT FOR MATERIALS TO PRODUCE UNIQUE 1911S, MAKING THUNDER DOWN UNDER WAS A REACH TO THE FAR SIDE OF THE WORLD. 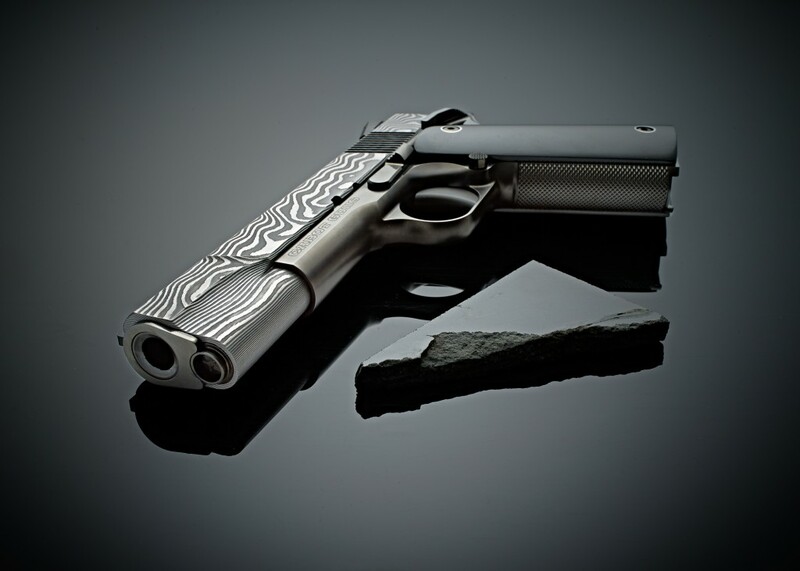 SUPREME QUALITY ARTISAN FORGED DAMASCUS AND AUSTRALIAN BLACK JADE WERE THE INSPIRATION FOR THIS UNIQUE CABOT 1911 CHAMBERED IN 10 MM. Jade, that precious rock found in small quantities at locations throughout the world, was prized by Stone Age man because it could be made into an axe that was tough enough to resist breaking when chopping wood or used in battle. Natural glasses like obsidian and high-silica rocks like flint could be chipped into sharper tools, but none were as durable as jade. Forming masses of jade in the earth is a multi-step process. First, one has to have a source of nearly pure amphibole or pyroxene-rich rocks which are most often derived from the earth’s mantle about 10-miles deep. It takes the cataclysmic forces of colliding crustal plates to bring this rock to the surface. These up-thrusting motions and subsequent erosion over a billion years expose some of the world’s oldest rocks. Under the extreme temperatures and pressures generated by thrusting, the rock flows like toothpaste, and once-continuous layers become separated into pods as they move upwards. As the surface is approached, water enters the system and the iron and magnesium containing silicates are converted into bundles of fibers that are typically 0.1-0.5 microns thick and 50-120 microns long. Asbestos is an example of mineral fibers, but those in jade are much smaller and interlaced which makes the rock hard and fracture resistant. To find nephrite (amphibole-derived jade) or jadeite (pyroxene-derived jade) one must search among the world’s oldest rocks where continental plates once collided and mixed crustal and mantle materials. One happened in 1965 on the Eyre Peninsula of South Australia when Harry Schiller picked up a heavy, rusty-looking rock in his field. This was the first sample from the Cowell jade deposit that has been exploited since 1982 and had shipped 500 tons of the material by 2013. This jade is unusual in that the source amphiboles were derived from a magnesium-rich limestone originally formed by some of the world’s earliest forms of life. Caught in faults and exposed to high-temperature water, the amphiboles were attacked by temperature and pressure and converted into fibrous mineral forms. Both temperature and differential stresses were necessary to make the jade, just as it takes pressure to compact wood fibers into a sheet of paper. Cowell jade is found as discrete bodies surrounded by marble. The jade weathers out as rusty-looking masses which have colors ranging from yellow-green to black when cut. The most highly prized material is a high iron black jade which can take a polished finish. Extracting this jade is more like pulling teeth than conventional drilling and blasting. This material was used to make the grips of Thunder Down Under, a Cabot Arms 10mm Colt 1911 automatic pistol. The jet black jade grips are paired with a striking black and white herringbone Damascus slide and jade magazine floorplate to make a dramatic statement. Built to match standards, the pistol is chambered for the 10 mm Colt Auto cartridge which was originated by Jeff Cooper to be the equivalent of the .41 Remington Magnum pistol cartridge used in Smith and Wesson revolvers. Both rounds were designed to give highway patrol officers guns that were more powerful than their issue .45 ACP or .357 Magnums. The revolver cartridge did not catch on as it was used in heavy pistols based on the .44 Remington Magnum frame. 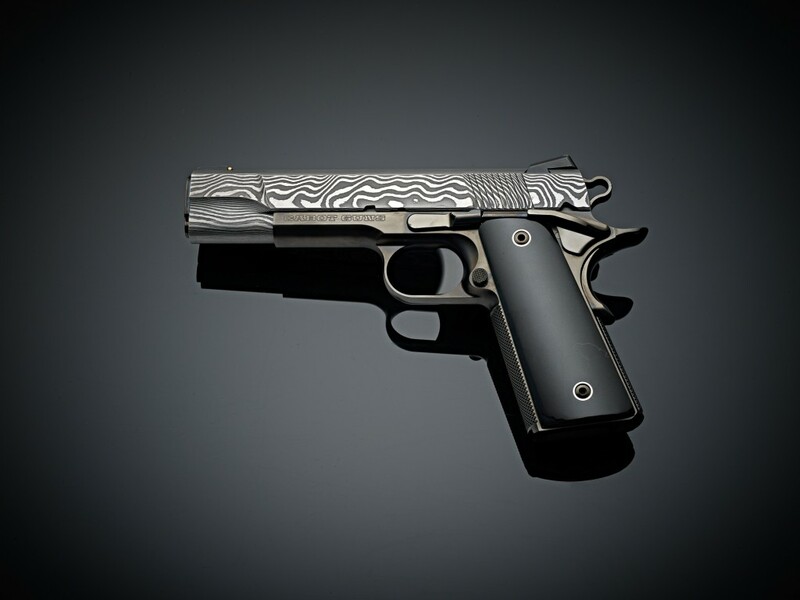 There is no size differential between 1911s chambered for the .45 ACP and the 10 mm Colt. However, the 10 mm was so powerful that its FBI load was cut to reduced penetration. 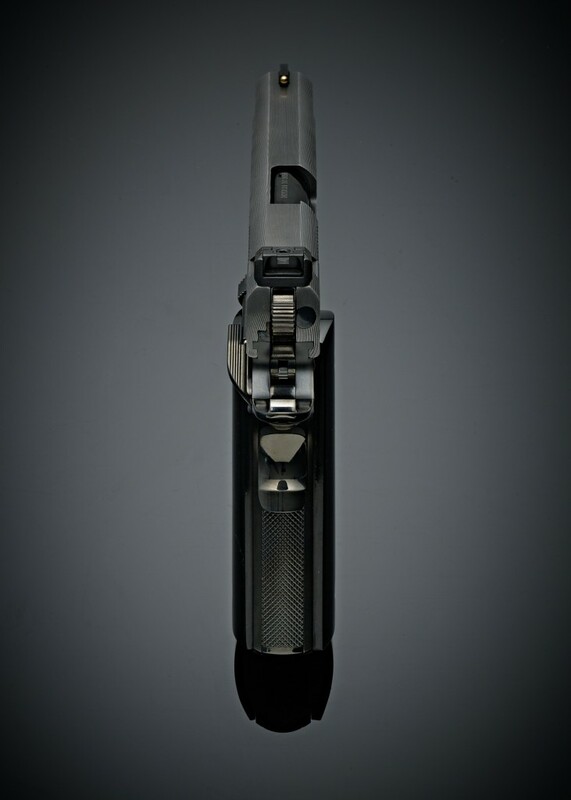 Downloading ultimately resulted in the shorter .40 S&W auto round which is widely used by police departments in a variety of semi-automatic pistols. Loaded with tough bullets, the 10 mm is sometimes used in the U.S. for hunting wild hogs and whitetail deer weighing up to 200 pounds. This round is undergoing a revival. 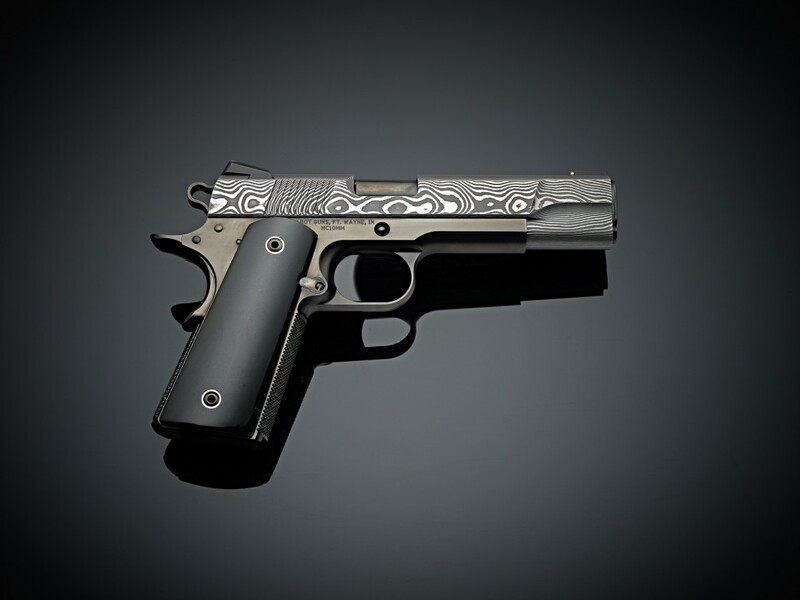 Besides the more common .45 ACP and 9 mm, Cabot Guns can custom chamber an OAK grade custom 1911 in .38 Colt Super Auto and the 10 mm Colt auto to give users a variety of choices to collect, for self-defense and competition. 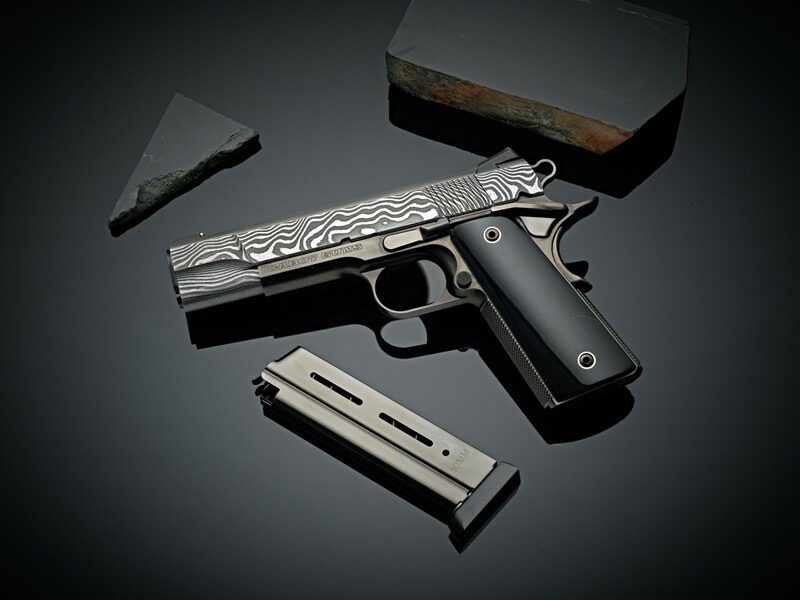 Always on the lookout for materials to produce unique 1911s, making Thunder Down Under was a reach to the far side of the world. It sits in the collection of a long term special Cabot Collector.